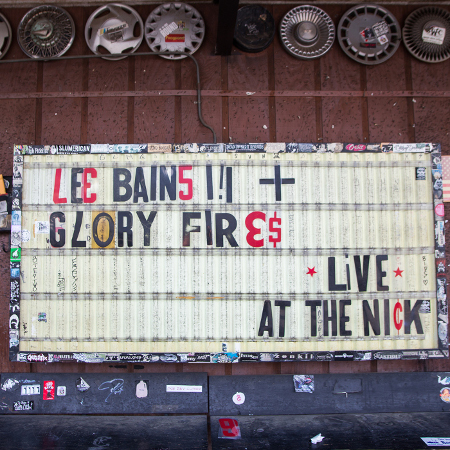 Lee Bains III & the Glory Fires drop surprise live album "Live at the Nick"
Out today on Don Giovanni Records, Live at the Nick documents Lee Bains & the Glory Fires' two night stand at The Nick late last year in their hometown of Birmingham, AL. Taped at the culmination of more than six months of touring for their 2017 2xLPYouth Detention, these shows took place at a tense moment for the band, personally and also politically -- with Roy Moore then still in the running for a US Senate seat. In August, the band will embark on a tour of the UK and Europe followed by a jaunt through the southeast joined by Bad Moves and Nana Grizol. Find the full list of dates below. In November of 2017, we played two nights at The Nick in Birmingham with some of our favorite Alabama bands -- \\GT//, Shaheed & DJ Supreme, Bad Example, Dommel Mossel, Me & My Knife, and Snacks, and raising attention for our friends at Alabama Coalition for Immigrant Justice and Hometown Action. Tension was in the air. While Trump's deportation squads, racial vitriol, and anti-worker policies were strafing the country, Alabama was caught in the most heated U.S. Senate race of our lifetimes. Roy Moore, whose reign as a Christian-supremacist homophobic judge had spanned most of our lives, was in great danger of being sent to D.C. as Alabama's senator. Meanwhile, our former Senator Jeff Sessions was implementing and excusing the worst of Trump's policies as Attorney General. It was fitting, then, to find ourselves in the heart of Birmingham's Southside, the neighborhood that so many young Alabamians have found as a sanctuary, and inside the pine-box walls of the Nick, where many of us ordered our first beer, or saw our first indie rock show, or watched our first bleary-eyed sunup. While the world roiled beyond the slanting, sun-bleached front porch, we felt together and strong inside. We still do. We sent Roy Moore packing, and we're working on Sessions and Trump, too. This record is about raising hell for and from your home-place and your home-folks. Let's keep on working.